The Coach House is a beautifully refurbished Victorian property that combines period features with modern convenience. Located in the historic city of Cambridge, the Coach House sits opposite the River Cam and Jesus Green, has its own small driveway and is just a short walk from the city centre. The Coach House has the flexibility to be ideal for a variety of guests: as a self-catering property close to the city centre. NB there is no freezer), it is perfect for families and couples, whether on holiday, or attending a wedding, graduation ceremony or university open day. 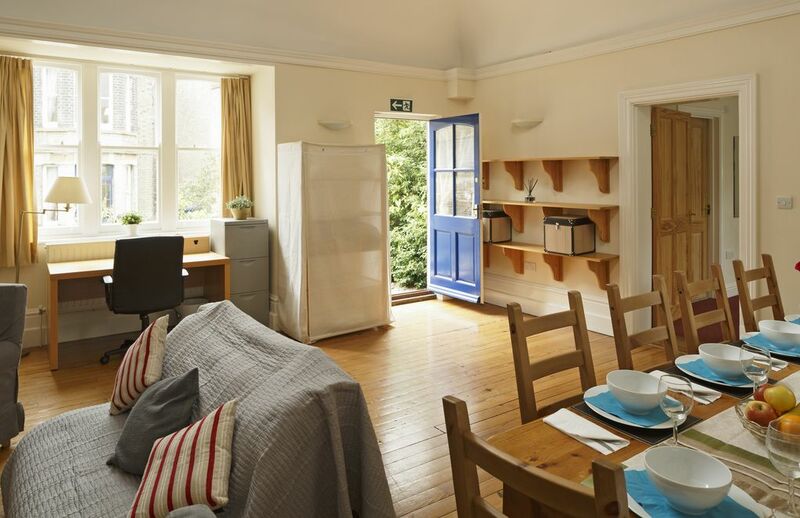 It is also suitable for those who are in Cambridge on business, looking for more independence during their stay in a homely environment: wifi is available throughout the property, and there is a printer available for use and a desk, overlooking the internal courtyard. The main living area of this Victorian building has a stunning raised ceiling, with extraordinary period details around the high-level windows that help to create a bright, airy space. There is a large dining table seating up to 10 people; a double bedroom with en-suite bathroom that has both a bath and shower; and a fully furnished kitchen. It can sleep 4 using the double bed and the futon sofa bed. Kindly note that the bathroom is only accessible from the main bedroom, so any groups making use of the futon sofa need to be good friends! Whether in Cambridge for leisure or business, the Coach House provides a comfortable base, with armchairs, a sofa and television. Look forward to welcoming you to the Coach House. Guests can access the driveway (for on-site parking), the courtyard and everything inside the cottage. A home from home! Guests are free to get in touch at any point during their stay, and we’ll do our best to help. For a period property, the Coach House is surprisingly spacious, with lots of natural light, giving it a bright and airy feel. Its location is ideal, and we’re sure you’ll enjoy your stay here. Sink with separate hot and cold water taps. Wall mirror. Shelving unit. Wall cabinet. Toilet tissues, towels, basic cleaning products, soap provided. There is a double duvet and two pillows set for the double bed in the bedroom. On request, additional double set for the futon sofa can be provided. There is an Wi-Fi available. One bath sheet, one hand towel are provided for each guest. Living room provides dinning furniture, sofa, armchair, coffee table and TV set as well as a desk and a desk chair. We provide some basic spices and sugar as well as instant coffee and a selection of tea. Dinner plates and side plates, bowls, tall glasses, mugs, cutlery, chopping boards, set of knifes, sauce pans, frying pans, set of kitchen utensils (e.g. tin opener). All serves up to 8 people. Several cupboards and a lot of storage space as well as plenty of space on work tops. The wooden dinning table seats comfortably up to 10 people. There are several chairs and a high back bench. In the dinning area there are also armchairs,futon sofa bed, coffee table and TV set. Some board game to entertain the family. We really enjoyed our stay. It provided everything we needed....the big screen TV complete with Netflix was a bonus. The location was ideal. It was great to have the cleaning service half way through our stay. I would highly recommend it. The host was accommodating and addressed queries regarding a billing issue through the site promptly. Great location, natural light, charming. Glad I could be of assistance to you and pleased you enjoyed your stay. You are of course welcome back anytime. When we arrived it became clear that we had accidentally booked the wrong apartment (too small). The homeowner seemed very understanding and helpful, and helped find a different one. She let us believe that we could find a good solution with the costs - well, it turned out her idea of the good solution was to keep all money. In the end we had to pay one night less, but she even kept the cleaning fee of an apartment that we never used. Oh, and as a bonus, the price they told us of the new apartment was without 20% tax, something we would find out only after it's too late. Don't go here! Unfortunately this guest was mistaken about the size of the property and believed it had three bedrooms, despite a clear description on the advert. Upon arrival the guest contacted me in a very upset state and I immediately went to see her at the property. Whilst the error was entirely hers, I endeavoured to help find alternative accommodation, which I did. The immediate priority was to help this guest find alternative accommodation and we did not discuss a refund at that stage. This is the only time in a number of years that a guest has believed the property to be a three-bedroom property, and unfortunately we were unable to offer a full refund given that the guest chose to cancel upon arrival, leaving us with no possibility of finding alternative guests. As a gesture of good will we offered a one night refund (for a three-night stay) – something we were under no obligation to do. We are confident we did everything we could in this situation. Whilst we appreciate it is disappointing, it would not be sustainable for us to refund guests who choose to cancel their bookings during their stay with us because of an error on their part. Thankfully this has been an isolated incident of misunderstanding on a guest's part - the vast majority of the hundreds of guests we have welcomed over the years are very pleased with their stay in this one-bedroom property and we are proud of the service we provide and the overwhelmingly positive feedback we consistently receive. Very comfortable. Well located. All the conveniences of home. A cozy place on a cold winter night. The property condition is a bit tired. First impressions were that the whole of the property needed a good clean inside and out. It was lacking in little things, for example the clock did not work, the copier had no ink, the TV was lacking instructions (could not get BBC 1 or 2!) There were no tea towels and it took over 1/2 hour to heat up a small pizza in the oven. The bins in the kitchen were very dirty and smelly. Having said all of this it is in an ideal location and we had a lovely stay in Cambridge but would have to think carefully about returning to this cottage. We had no trouble finding the property which was warm and clean on arrival. The location is great, just a 5 minute or so walk across Jesus Green to the town centre. We chose this property because it had a car parking space which is essential in Cambridge as most of the parking is for residents only. Just two hiccups - the bed is a pull down Double (hubbies feet dangled over the end) with a lumpy mattress, so I hope that this is addressed by the new owners asap. Other tradesmen and cleaners use the parking area, so we were blocked in or couldn't gain entry 3 days out of 4, however generally we found the person blocking and were able to gain access relatively quickly. Dealing with Sue was a pleasure, she responds very quickly. Located just opposite Jesus Green, the Coach House is a lovely 10 minute walk by the River Cam into the city centre. Cambridge itself is famed for its University and the colleges that are its embodiment. No visit is complete without a peek at the stunning chapel at King’s College, and there are museums, shops, theatres, cinemas, cafés & restaurants aplenty! Further afield, you’ll find the beautiful village of Grantchester made famous by poets Lord Byron and Rupert Brooke (within walking distance from the city and ideal for a cream tea in The Orchard Tea Garden!) And if you feel the urge for a trip to the capital (or need to attend a meeting), direct trains run every half an hour to London and will have you there in 45 minutes. We love Cambridge, and we’re sure you will too – we’re always happy to provide you with information about the local area, and our house manual contains lots of useful information so that you can make the most out of your stay at the Coach House.